decorating our Christmas tree and home for the holidays! 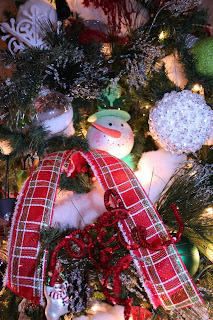 Holiday Themed Decorated Christmas Trees & Christmas decorations. 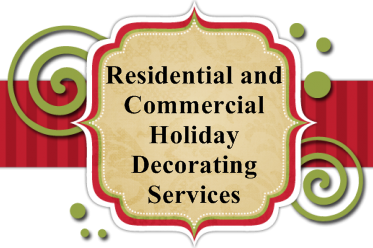 Our professional decorating team offers custom holiday decorating themes & custom themed decorated Christmas trees and decorations through out the homes of Charlotte, NC , South Charlotte, Weddington and the Metro area, including Upper SC. 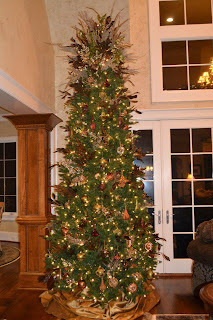 The tree featured above was inspired by our clients home decor in the Lake Norman Mooresville NC area. 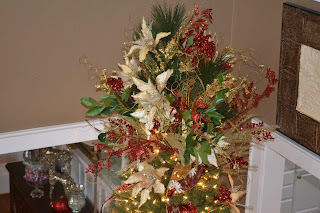 Our client "Jena" wanted her holiday decorating colors of reds, gold’s, and creams to accent the living room, dining room and foyer area of the home. "Creating Christmas tree toppers, and holiday themed decors for our clients allows our team of holiday decorators to think out the box and be creative with different holiday decorations. We love to go shopping for decorations and/or use existing holiday decorations from our clients. Holiday decorating is just one of our passions and we look forward to each and every holiday. What a great feeling it is to see the smiles on our clients faces! Priceless! " Inspired by the beauty of this traditional dining room, we chose holiday decorations from our local holiday suppliers, Pier One, Southern Roots and Pottery Barn to create this table centerpiece for our clients family Christmas party. 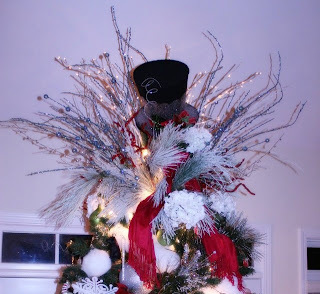 One of our favorite Christmas tree toppers....okay we like them all! This tree was special because it was placed in the master bedroom of our client’s home, so they could enjoy the beauty and Christmas lights while relaxing in their master bedroom. 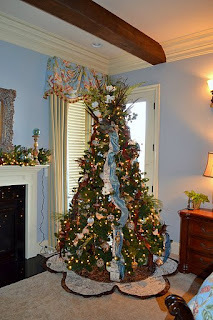 We love Frontgate holiday decorations, and Southern Roots decorations that we selected for this Christmas tree. 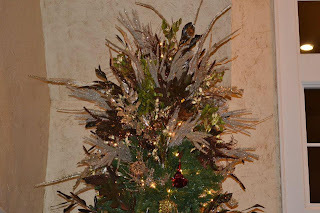 We again created a custom Christmas tree topper using decorations that inspired our client. The Tuscan/Rustic themed Christmas tree and holiday decorations for this home were a true delight to install and take-down after the holidays. 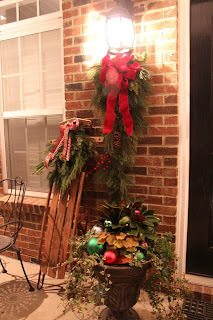 Holiday Decorators - Charlotte NC Peggy and Tonia had so much fun shopping and decorating this home for the holidays. 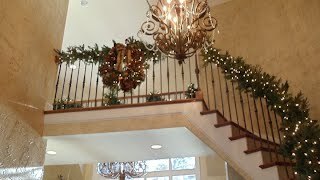 We had a great joy to see the look on our clients faces when we have completed our holiday decorating installs. Once we have decorated our client’s homes for the holidays and seasonal decorating, we always receive returned satisfied customers the next year. 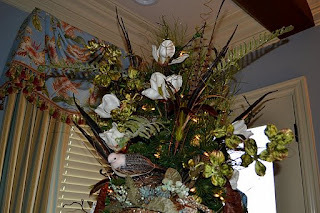 We simply love decorating homes and businesses for the holidays." 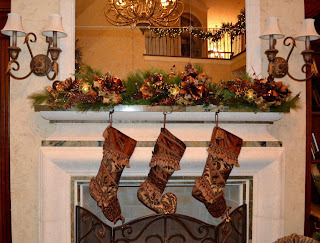 We adore a fireplace in a formal living room or family room with holiday decorations of garlands, holiday lights, stockings, berries, Christmas or Seasonal ribbons and silk flowers. 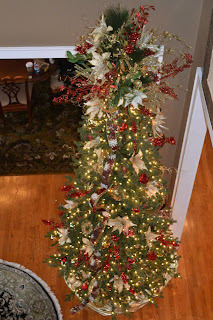 Peggy & Tonia Holiday Decorators of Charlotte, NC and Metro Area say; "Decorate your rooms, Christmas trees and outdoor spaces, with decorations that have personal meaning and traditions to you and your family." Greet family and friends in your foyer with a beautiful pre-lit garland and teardrop on the stairwell. Nothing states, "Welcome" like holiday lights and decorations during the holidays. 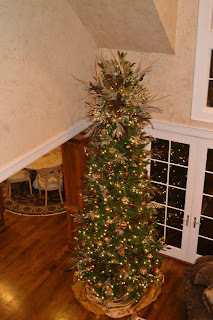 "Client Spotlight" This is the 2nd year I have used the services of a professional holiday decorating company. After meeting Peggy & Tonia, I knew I would have them back year after year. Once I saw the beautiful display of Christmas decorations being creatively displayed and hung around my rooms....I was so excited and felt a sigh of relief...no stress for me during the holidays. I left the holiday shopping, decorating, holiday install and take-down to the holiday professionals. Winter Wonderland Themed Christmas tree topper and decorations for our client to enjoy during the holidays of Thanksgiving - Christmas - & New Year's! "This Snowman/Winter Wonderland Themed Tree and decorations were so much fun to shop for because we could be so creative with items we purchased for our client, plus use her existing decorations too! We look forward to decorating this Christmas tree, outdoor spaces and rooms again for the holidays!" 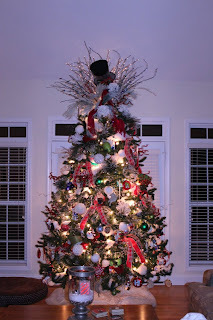 "Client Spotlight" My husband and I were so thrilled when we got home and saw our house and Christmas tree decorated with a Snowman/Winter Wonderland Theme! They didn't miss a beat, they shopped for new holiday decorations and even used our existing holiday decorations of snowmen I had collected over the years! These girls are top notch, and we will be using them again for the next seasonal and holiday decorating at our home! You will be the envy of your guest when your home is decorated for the holiday season. Choose a theme that fits your style and decor. Family and Friends will always enjoy the holidays in your home. The holiday season can add on more stress. 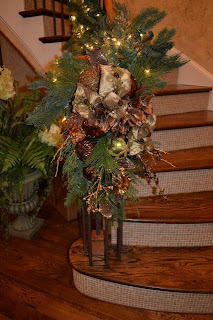 Peggy and Tonia offer many holiday decorating packages whether you like it simple or over the top. Offering Holiday Shopping, Holiday Interior - Exterior Installs, Holiday Interior -Exterior Uninstalls & Outdoor Lighting. 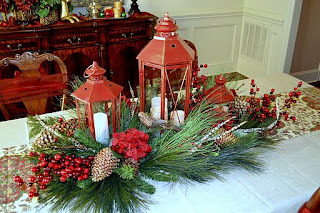 We Provide Holiday -Event Decorating in North and South Carolina.